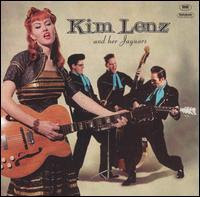 Female singers at the forefront of the rockabilly movement can be counted on one hand - Wanda Jackson and Janis Martin are probably the two most famous - but add to that list one red-hot (tressed) lady from Dallas who fronts one of the most-talked-about combos of that genre: Kim Lenz and her Jaguars. Daughter of a rodeo queen, Kim Lenz became interested in rockabilly at an early age, influenced by the aforementioned Jackson and Martin - as well as Barbara Pittman - on the female side, and such honky-tonk standard-bearers as Johnny Carroll, Charlie Feathers, Johnny Horton, and Faron Young. Lenz grew up in Southern California, relocating to Dallas in 1994, and forming the band in 1996. Since then, Kim Lenz and her Jaguars have taken off, becoming a buzz band not only in their native Texas, but all over the world-wide rockabilly circuit. Fans and critics alike rave about the band's live shows, sparked by Kim's energetic stage presence, powerful vocals, and drivin' rhythm guitar. Lenz is backed by one of the most solid bands on the road today. Lead guitarist Tom Umberger generates a pure vintage sound through his rig. Shawn Supra slaps his bass fiddle for all it's worth, and Scotty Tecce takes no prisoners on drums. A four-track E.P., released in 1996, further fueled the excitement and in 1997, Kim Lenz was voted Best Female Vocalist by the Dallas Observer. All of this has led up to the release of the band's self-titled debut album on HighTone Records' HMG label. To create a more authentic sound, the band enlisted the help of producer Wally Hersom, best-known as the bassist in Big Sandy and his Fly-Rite Boys, who recorded the album totally live in the studio without any overdubs.